Holiday Home Rentals Dubrovnik – Mediterranean Adventures & Agritourism Croatia. “Kameni Dvori” provides holiday home rentals in a rustic villa on two floors, stylishly equipped with outdoor swimming pool. The villa is located in the village Lovorno, Konavle area, 15 min. from Dubrovnik airport, Croatia. The property is surrounded by rich Mediterranean vegetation and has a beautiful view of the Konavle valley, where guests can rent a unique vineyard cottage. Both holiday home rentals are perfect for those seeking a fun, yet quit and relaxing holiday in Dubrovnik, south Croatia. Families, couples & business guests are welcome! View Holiday Home Rentals – Villa & Cottage Accommodation. The Konavle countryside provides a wide variety of organised adventures & tour programs for 1,3,5 & 7 days. For those living in crowded & busy cities, these adventures provide the perfect escape & getaway holiday! The Konavle region is full of undiscovered beauties and legendary stories. 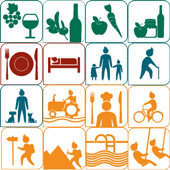 We are sure that some will match your specific taste or interest; from wine & gastronomy – enjoyed for centuries, nature & flora programs – wondering, hiking, cycle routes as well as geo historical programs with past & present cultural experiences! Discover Croatia’s Holiday Adventure Programs & Tours in Dubrovnik. Kameni Dvori Tavern Inn offers a variety of Konavle traditional meals. All dishes are prepared with carefully grown fresh & organic local crops. Our Wine cellar is small, but produces quality liqueurs, white & red wines. Traditional recipes and gourmet dishes await your arrival. We also offer cocking lessons and recipes for those in love with our typical Konavle meals and food. Experience the The Kameni Dvori Tavern Inn – Konavle Local Specialities. Agritourism in Croatia is a form of sustainable eco-tourism combined with different agricultural activities. Guests familiarize themselves with our agricultural & farm life , and enjoy the nature & eco-friendly products. Every season of the year promises crops from various farm activities; growing grapes and wine production, olive oil production, organic vegetables, fruits & herbs. Learn about Agritourism in Dubrovnik – ECO Friendly Farming Activities. “Kameni Dvori” & the family “Mujo”, Lovorno, Konavle. Croatian Agritourism has allowed the family “Mujo” to preserve it’s traditional way of life as it once was. “Lovorno” is a quiet village in the region of Konavle near Dubrovnik Airport, Croatia. The renovated family owned Villa has a rich history and was built with natural materials. Today, “Kameni Dvori” presents an ideal location for a Relaxing and if desired Adventurous Holiday. Make your Holiday simply Unforgettable! The family “Mujo” welcomes you sincerely! Learn more about “Kameni Dvori & the Family Mujo”, view our latest guest Testimonials, follow our news and feel free to contact us at any time!